A strengthening tropical system has its eyes set on Taiwan and eastern China during the second half of this week. Talim is currently a typhoon about 400 miles east of Taiwan. Further intensification is expected as Talim tracks to the northwest towards Taiwan through late Wednesday. 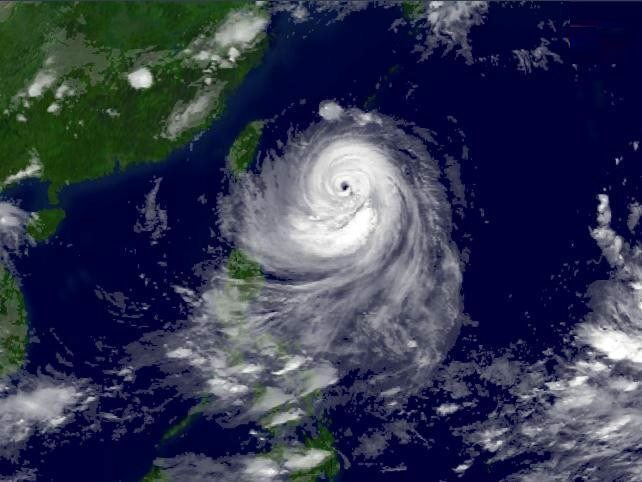 “Favorable environmental conditions along the path of Talim will allow the typhoon to become very intense before reaching Taiwan,” AccuWeather Meteorologist Adam Douty said. Warm water will provide the fuel for Talim to strengthen over the coming days. Wind shear, which is the change in wind speed and direction at different levels of the atmosphere, will also be favorable for proper venting of the system. Rough seas are expected around Talim over the next few days as the system stirs the ocean. Shipping interests in the area will need to reroute around the storm. Surf along Taiwan’s northern and eastern coast will increase through the next couple of days. Wind and rain will begin to increase across northern Taiwan late Wednesday as Talim approaches from the east. The most intense rain and wind across this area will occur Wednesday night into Thursday as Talim’s center passes over or just to the north of Taiwan. Rainfall of 100 to 200 mm (4 to 8 inches) will be possible across northern Taiwan, including Taipei, which will lead to flooding. Localized higher amounts of up to 380 mm (15 inches) will be possible, especially across the higher terrain. Downed trees and road washouts will lead to travel disruptions well after the storm leaves the area. Residents will need to watch out for mudslides which could be triggered by the heavy rain. Far southern Taiwan will likely escape most of Talim’s wrath as the system tracks far enough north. However, rough seas and minor coastal flooding in low-lying areas will be possible. 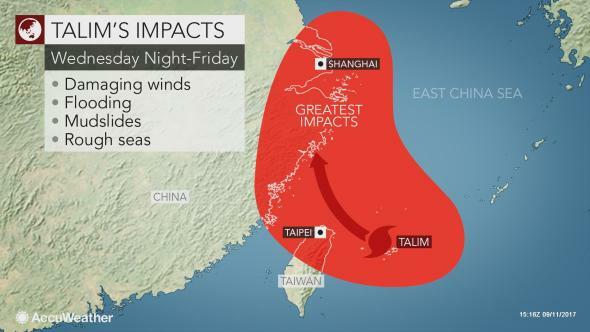 Beyond Taiwan, Talim is expected to curve northward and eventually northeastward Thursday and Friday tracking through or near eastern China. “There is some question as to when exactly this curve will occur which has implications on Talim’s impacts on China,” Douty said. 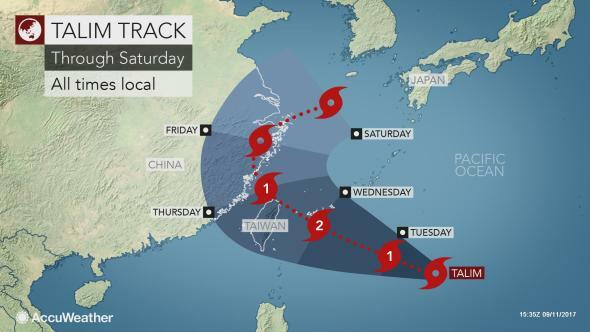 Talim will likely weaken as it interacts with Taiwan, but it will still be a dangerous storm. If Talim is slower to turn, then it will take a track farther into eastern China, spreading flooding rain and gusty winds inland across Fujian, Zhejiang and Jiangsu. However, if Talim turns quicker, then heavy rain and gusty winds will be more confined closer to the coast, sparing inland areas from the worst impacts. In either case, Shanghai will be at risk for heavy rain and gusty winds, both of which could lead to life-threatening conditions. Uncertainty largely increases heading into the weekend. However, AccuWeather meteorologists are concerned Talim may track heavy rain into Japan or South Korea Saturday and Sunday. The state of Talim and the extent of impacts after it moves away from China will ultimately depend on when Talim makes the turn and how long it will be over water. Residents and those with interest in Japan and South Korea should continue monitoring the progression of Talim over the next few days.